This article has been viewed 15659 times. Most people cringe at the thought of having kidney stones. To women who have borne children say the pain of passing a kidney stone is similar to that of having a baby! What is a kidney stone? 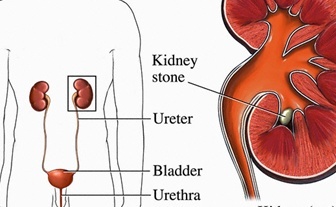 A kidney stone is a mass comprised of crystals that separate from urine and develop over time. The kidney stone is hard and depending on its size can either pass un-noticed or cause intense pain. Symptoms of a kidney stone could be sharp pain that increases in severity as time progresses. The pain could be felt in the abdominal, back, side, groin or genital area. Nausea and vomiting are common symptoms as well as blood in the urine and pain while trying or during urination. To help prevent developing a kidney stone changing a few simple things in your diet can help; cut down on sugar intake, caffeine, meats, dairy and soda. Drink more water! Increase your intake of vegetables, fruit, whole grains and fiber but be wary of spinach, rhubarb, beets, nuts, chocolate, black tea, wheat bran, strawberries, and beans as the are contain oxalate. Food such as; asparagus root, birch leaf, couch grass, goldenrod, horsetail, lovage, parsley, and stinging nettle are particularly good at increasing urine volume that has an effect of reducing kidney stones or the size on one. Unfortunately, some people are more susceptible to develop a kidney stone than others. If you have family history of kidney stones then you should be on alert. Most people that develop kidney stones are between the ages of 20-50 years old. Sometimes medication can increase your chances of developing a kidney stone or an environment within your body that encourages the growth of kidney stones. Really one of the most effective ways that is generally a great habit for life is to drink more water. Some people love water, they drink it all the time. Other people don't like the taste or lack of and there are people who just forget. If you don't like the way water tastes buy a bunch of lemons or limes and slip a slice into your glass or water bottle to add a little flavor. If you forget to drink get into the habit of always carrying a water bottle around with you or every time you see a water fountain stop for a drink. Increasing water within your body is always great; your chances of developing a kidney stone will decrease while you experience many more multiple health benefits.